Our new Elite Consultant, multi-produced screenwriter Bobby Lee Darby, shares his pitching tips on how you should approach pitching to Hollywood, how to plan for it, and how to ace it! Bobby thinks that the real experience of pitching is nothing like it seems in the books about the subject. Having made a lot of pitches, many of them successful, and watching a lot of other people’s pitches and reading the room while they happen, he’s got a strong grasp of how they really work in the industry right now. 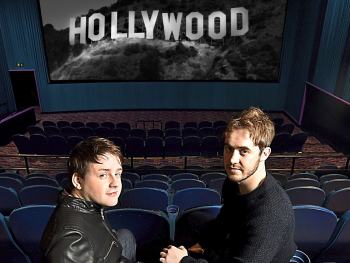 Bobby (right) pictured with his writing partner Nathan Brookes. There are two types of pitching in the industry. Firstly, the “original pitch” – you try to sell your original idea, your original script in the hope that whoever you’re pitching to takes a shot on it. The second type of pitching is “assignment”. This is when you compete for the right to write the script for an already-greenlit project against other writers. For example, a company or a producer may have the film rights to a successful novel. They will hear pitches from several writers and agents, and whoever has the best pitch takes the project and gets to write the script. Pitching is most often a cheap way for production companies to unearth good ideas and good scripts. It’s a low-risk, high yield investment to them. They only need one exceptional idea to make a ton of cash. A good idea could go for up to 6 figures, but producers will snap something up for $50,000 (minimum) under WGA terms. You could hold out for more, but they have the power. They have many writers and agents waiting for their chance, while the writers themselves could go years without even getting that opportunity again. A two-sentence pitch often works well and flows nicely. This is how you grab the producer’s attention. This is how you tell them everything they need to know about the script, and in no more than 10-20 seconds. So, here’s a small task for you to try this out. Write that two-sentence pitch for STAR WARS (the original movie, ie EPISODE VI: A NEW HOPE! ), or JURASSIC PARK (or, even better, for your own script!). You should look to get a lot of practice of doing this for different films – ones you know well, ones of your own. There are 5 important aspects you need to include in this pitch. The obstacle – whether that’s the antagonist, or something the hero must overcome. It is important to include all of these things in your pitch, and perhaps more importantly, not to confuse the importance of one over the other. For example, if you feel your antagonist is the strongest character, great, but don’t go on about them. Producers and execs want to know who your hero is, who this story is about, not the villain. If the person who you’re pitching to doesn’t know who the lead character is, they won’t feel a connection to your story. (This is also true of storytelling on a much wider scale – that’s maybe an article for Ian to do another time!) Characters are particularly important, especially for Hollywood execs. They are always thinking “who can I cast as the hero?”, “which actor would best sell this role/film?” A lot of pitches that we’ve seen fail weren’t talking about the main character enough to give people a connection to them. It is so important that you know the script better than your family. You have to be ready to answer something like “what happens on page 89?” in an instant. If it looks like you don’t know the script that well, it’ll look like you don’t particularly care about it. It’s also vital that you spend a certain amount of time talking about each part of your script, giving rough time limits to each act. You won’t get much time to impress, so you need to be precise and concise. Here’s a decent breakdown of each act, how long you should spend on it, and what to talk about. In total you get maybe 10 minutes of the exec’s time, max. Act 1 – 2-3 minutes – As the script does, you must set up the story, introduce the hero, the supporting characters, present the obstacle, imply the genre and tone of the story. A good start can make all the difference. Act 2 – 3-4 minutes – the crux of the script should take up the biggest chunk of the pitching time. As Act 2 is the largest Act, it is more important than ever to be concise here. Don’t waste time on things that are irrelevant to the story. Focus on what matters. Act 3 – 1 minute. Just wrap it up, but don’t give away everything. End on a cliffhanger. You want the execs to say “what happens next?”, “how does it end?” If you’ve got them asking that, you’ve got ‘em biting. It’s also important to talk about and spend a good 2-3 minutes on the characters and theme(s) of the script. The execs you’re pitching to are always thinking how they can make money from this script, so it’s important to not only sell the story, but also the idea. One nice way of doing this is to provide a “big trailer moment”. A “trailer moment” is simply a piece of action, dialogue, a striking image, that would work well in the trailer for this film. Think of SE7EN’s “seven sins” concept which they used for an effective trailer moment. You give the execs a trailer moment, and they will start to picture this film coming to life, and, of course, making them money. In essence, pitching is all about storytelling. If you can tell a good story, that will be a big advantage for you. Try practicing on friends, colleagues, anyone who hasn’t read the script already. You need to know your script better than yourself. You need to know the peak of your script in relation to its genre – its funniest, scariest, most romantic moment. Have your pitch ready at any time. You never know who you might meet today. And yeah, have backup pitches prepared to fall back on, because there might be some unavoidable block that your pitch can’t get around, however good it is, and you always need to be thinking a few scripts ahead of where you’re at in your career right now if you’re going to stay in work. One final thing… be confident. Relaxed, not arrogant, but confident. You belong there as much as anybody else. 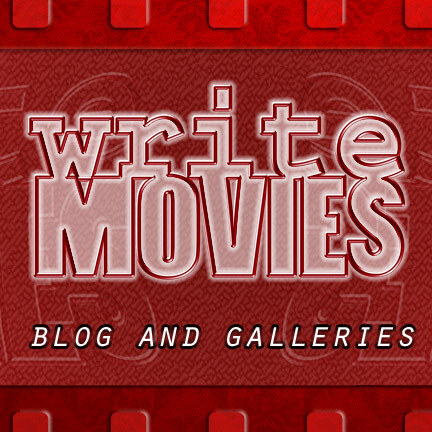 Jamie White, the WriteMovies team.